The “10 Best Animated Films of All Time”, according to Terry Gilliam. The following text has been copied from an interview with Terry Gilliam (source: http://www.guardian.co.uk/film/2001/apr/27/culture.features1) in which the animator, filmmaker and former member of Monty Python reveals his creative inspirations. For me, as an American growing up in Minnesota, Walt Disney was animation. But the joy of Disney’s films always came from watching the baddies. Pinocchio is visually the richest of his features and it is also the darkest. The Bad Boys’ World is a truly immortal nightmare, full of eerie images of kids turning into donkeys and all manner of strangeness. Then there is that stuff with cages, and I notice now that every film I have made features a scene with somebody in a cage – a trait I attribute to watching Pinocchio. Great songs in that film too; Disney was essentially a musical film-maker. Plus there is something intriguing about a character who desperately wants to be a real person, but who we all think is actually more interesting as a piece of wood. The magic of Tex Avery’s animation is the sheer extremity of it all. The classic Avery image is of someone’s mouth falling open down to their feet, wham, their eyes whooping out and their tongue unrolling for about half a mile: that is the most wonderfully liberating spectacle. Avery would just stretch the human body and face however he liked, and the result was unbelievably funny. There is no hesitation in his work, no sense that you can go too far. I think that nowadays they should put on Tex Avery festivals as an antidote to political correctness. There is also a childlike sense of immortality and indestructibility in his work; people get squashed, mashed, bashed, bent out of shape, whatever, and they bounce back. In essence, it is like the myth of eternal life. I first saw this when I was a teenager and, in retrospect, it was a career leap for me. This was when I first discovered surrealism. You have a scenario in which you see an animator creating something which suddenly develops a life outside of the cartoon. The character starts communicating with the animator, and then it is Frankenstein all over again, the creation of a monster over which you have no control. Until I saw Out of the Inkwell, I had always thought of animation as existing on one plane, but here were the Fleischer brothers taking you right through the looking glass and into the picture. Of course, when I saw it I loved it – not because I wanted to be the animator whose ink comes to life, but because I wanted to be the animation, the clown wreaking havoc upon the world. 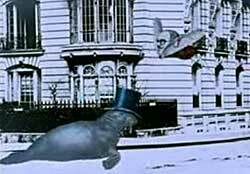 After college, I lived in New York with some people who would watch experimental avant-garde films. We embraced them because they annoyed everybody else, even though they were mostly awful. One night we were enduring some of this stuff when on to the screen came a cut-up image of Richard Nixon trying to talk with his foot in his mouth. It was the simplest animation pun imaginable. Years later, when I had come to England and we were working on a TV programme that was meant to make people laugh, there was a problem with dramatising one of the ideas. So I got a picture of Jimmy Young, cut it in half, moved his mouth around a bit and everybody laughed. That subsequently became a trademark, for which I think van der Beek should take credit. Walerian Borowczyk was a twisted man whose films were infused with a unique cruelty and weirdness. He started out making extraordinary animations, graduated to directing classics such as Goto, Island of Love and La bête, and then ended up directing Emmanuelle 5, which I think is a perversely fitting end. Les Jeux des Anges was my first experience of animation that was utterly impressionistic. It didn’t show me anything specific, just sound and movement from which you create a world of your own. Jan Svankmajer’s stop-motion work uses familiar, unremarkable objects in a way which is deeply disturbing. The first film of his that I saw was Alice, and I was extremely unsettled by the image of an animated rabbit which had real fur and real eyes. His films always leave me with mixed feelings, but they all have moments that really get to me; moments that evoke the nightmarish spectre of seeing commonplace things coming unexpectedly to life. There is something peculiar about falling for Jan Svankmajer and then discovering the Quay brothers – Americans who came to Europe and somehow wound up working in a style that felt like Polish animation. As an American, I always wanted to be seduced into this strange decadent, rotting idea of Europe, and the Quays have created that world in a manner which hypnotises me, but which I don’t fully understand. Maybe I like them because they ended up going further east than I did. John Lasseter’s work was the first digital animation that had genuine life in the characters. To be able to mix that level of characterisation with the smooth, crisp, clean quality of computer animation, to give it a real sense of three-dimensional existence, of touchiness and tactility, was like discovering a whole new texture of animation. The quality has endured from Lasseter’s short films such as Knickknack through to Toy Story 1 and 2, both of which are touching, funny, intelligent and brilliant. Parker and Stone are the only guys who were ever inspired by me, who took the crudeness of my animation to even lower depths. Their stuff is so shoddy that it is miraculous that it works at all. I assured them that while it may be great for TV, there was no way to sustain it for 90 minutes. And, of course, their movie worked just brilliantly. Nightmarish visions at 24 frames per second. The startling fantasy world of Jan Lenica’s “Labyrinth” (1963) owes a stylistic debt to the earlier Surrealist colleges of Max Ernst. Like the majority of moviegoers, I’m often bedazzled by the computer-generated worlds created by Pixar and Dreamworks. While it would be difficult to dispute the technical virtuosity of these animation mega-giants, I must admit to having a soft spot for the low-fi underdog that is stop-motion animation. Perhaps because it involves a fully manual approach that relies more heavily on materials than pixels, I feel a greater affinity for it. One of the most basic and “low-fi” of stop-motion techniques is the paper cutout which, as the name suggests, involves drawings or prints on paper that are cut out and manipulated to simulate movement. The high degree of artifice and theatricality associated with the paper cutout makes this technique particularly well suited to animations which are fantastic, dreamlike and surreal. Its relative simplicity enabled many visual artists not typically known as animators to use this technique to create time-based work. Polish filmmaker Walerian Borowczyk, who had received a very classical training in painting at the Academy of Fine Arts in Kraków, used paper cutouts to great effect in his animated short films Les Astronautes (1959) and Les jeux des anges (1964). 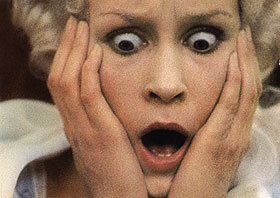 Borowczyk capitalized on the anti-realism of the cutout to produce his surreal and frequently nightmarish worlds. Borowczyk’s compatriot and sometimes collaborator Jan Lenica used paper cutouts for his masterful Labyrinth (1963), an animation that, through its incorporation of 19th-century illustrations, closely recalls the eerie beauty and surrealism of a Max Ernst college novel. Eastern European animators such as Borowczyk, Lenica, and the Czech stop-motion master Jan Švankmajer, were highly influential on the work of contemporary animators/filmmakers Tim Burton and Terry Gilliam. 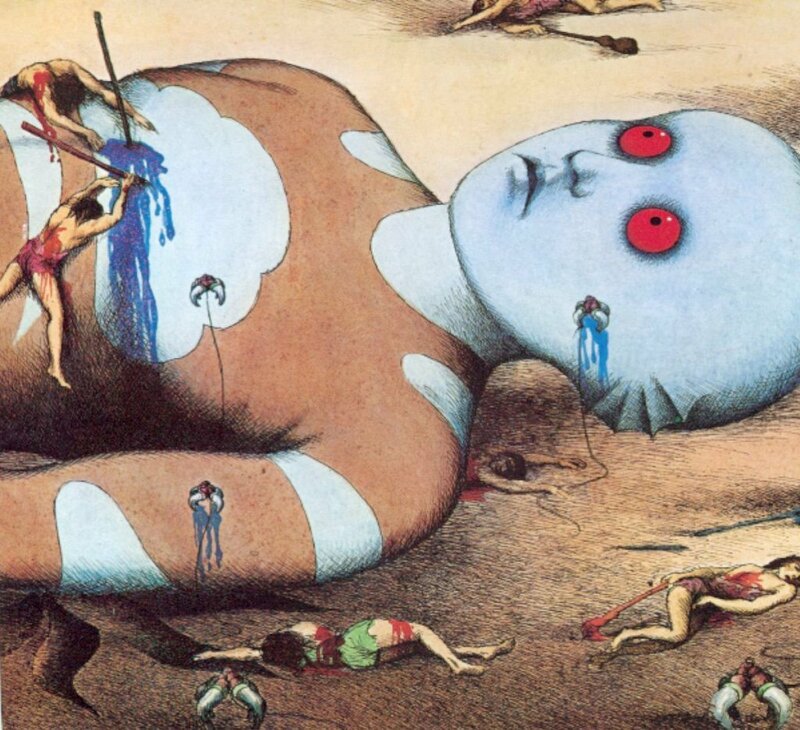 The Oms take down a giant Draag in Laloux’s surreal animated feature “Fantastic Planet” (1973). A joint production between France and the former Czechoslovakia, it’s Cold War politics are neatly embedded in the science fiction tale.